Foggy brain. Poor circulation. Back trouble. Decreased life expectancy. Yikes. This is your fate if you sit at a desk all day. Have you considered standing while you work? Several hundred thinkers at Facebook prefer to stand for the same reasons that da Vinci, Bonaparte, Churchill, Dickens and Hemingway did: They can think better standing up. "I feel more focused, more energized, and more productive," says Chris Freeman, Industrial Logic coach. When you stand, you can move more easily, allowing you to use your muscles constantly. Standing keeps your blood circulating well, and can keep your blood sugar better regulated and blood pressure lower, according to a study by Dr. John Buckley from the University of Chester. 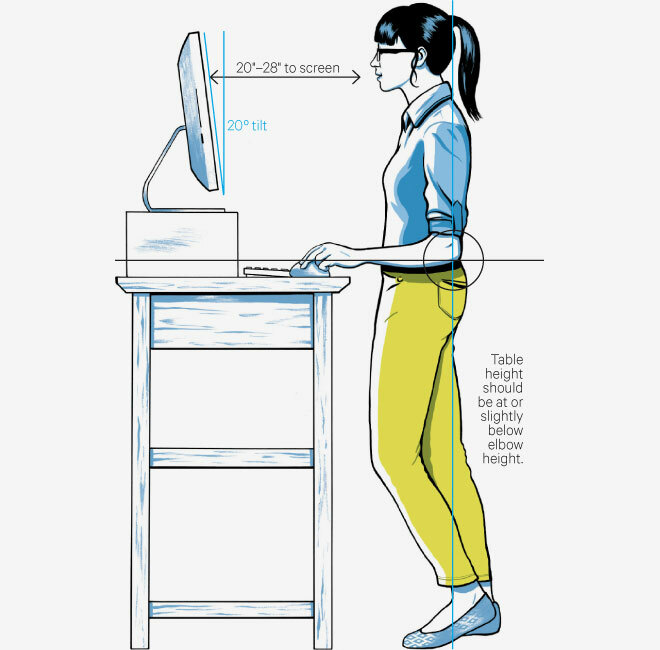 A standing desk means you burn more calories throughout the day - up to a third more. and a bad back due to an inflexible spine and disc damage. If we think for a living, then we must do what we can to keep our minds clear and focused. At Industrial Logic, many employees are changing their sitting ways to reap the health benefits of standing desks. Joshua (in the first photo above) likes the option of sitting or standing. He uses an adjustable keyboard mount to lower or raise where needed and two stacked monitors to accommodate both options. Curtis has been using a standing desk for many years. Within three weeks, he was a convert to full time standing. Following suggestions from a LifeHacker article, Curtis mounted his existing desk on an Ikea coffee table to get the correct height. He is a believer in the health benefits, and now likens sitting with smoking...don't do it. Chris has created his own unique solution for his standing desk, allowing him to work in a much smaller footprint. For under $100, Chris purchased two wall mounts for his monitors and a webcam. With cable management on the monitor wall, including a USB hub, Chris finds it much easier to access plugs. Wooden building blocks lift up his laptop to increase airflow. And with some ingenuity, a milk crate and a cafeteria tray, he created the perfect height for his keyboard. A microphone mounted on the wall finishes his setup. Chris doesn’t sit at his computer anymore, and feels more energetic and focused. His dance moves are much better, too. Another more expensive option is to try one of the new treadmill desks, which keeps you moving between 1-3mph. Easing into the transition is the best way to go. Have the option to sit and work in the beginning. Listen to your body; it will tell you what you need, such as supportive shoes, a cushioned mat to stand on, and when to take a break. Move around a lot as you work – shoulder rolls, shaking out your limbs, or as Ruud does, hop on a Bosu ball during a conference call to improve your balance. Check your posture, whether sitting or standing. For proper stance, your elbow should be at a 90 degree angle to your keyboard. So get out of your chair, engage your mind, and live a longer, healthier life! Send us a photo of your standing desk with the hashtag #mystandingdesk to twitter, Facebook or Pinterest by Monday, March 10, 2014, and we’ll enter you into a drawing to win an eLearning album from us on Refactoring. With this album, you can learn how to safely improve your software designs.